Organizations use multiple instances of services such as Elastic Compute Cloud (EC2), RDS on day to day basis to support their daily operations. Users are highly dependent on the performance of their instances. For better optimization of resources and better outputs, keeping track of your AWS EC2 instance generation is one major aspect. Hence, it becomes necessary to make sure that resources deployed are of the current generation which ensures cost savings as well as better performance of your cloud infrastructure. AWS Elastic Compute Cloud (EC2) is a web service interface that provides resizable compute capacity in your cloud environment. 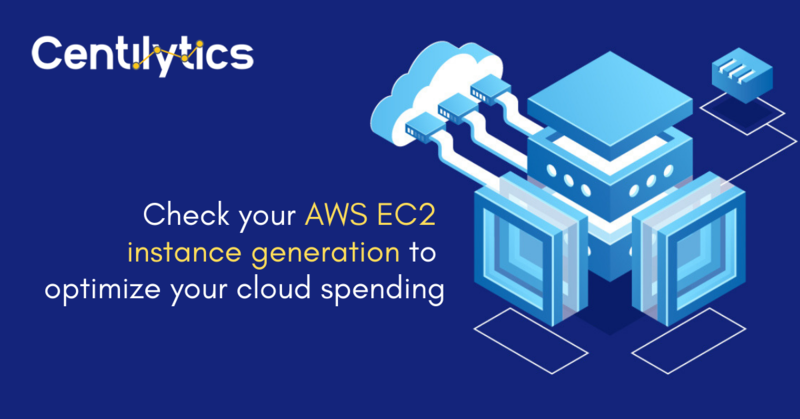 EC2 enables you to increase or decrease capacity and allows users to scale up or down the number of instances according to the requirement. Why you need to upgrade AWS EC2 instance generation? Potentially, users can have hundreds or even thousands of EC2 instances running in their infrastructure. Imagine that you have deployed thousands of EC2 instances which perform daily crucial operations of an organization. If somehow, EC2 instance performance and throughput increases, then it would lead to a substantial increase in output and productivity for the respective organization. Upgrading EC2 resources to the current generation has various benefits. Upgrading to the latest generation of instances helps in optimizing your cloud infrastructure and reducing overall expenditure. The latest generation of instances ensure better performance of CPU and leads to increased throughput of memory and network resources associated with EC2 instances. Some bug fixes and new features also get provisioned as an add-on which further enhances the performance and output of your EC2 instances. It is highly recommended that you upgrade your instances to the latest generation whenever an upgrade for the same is available. Centilytics provides special insight on your AWS EC2 instance generation. It tells you whether the instances being currently used in the cloud infrastructure are of the current generation or not. This helps the user to upgrade their EC2 instance generation and further enhance their overall performance of cloud. WARNING If the corresponding EC2 instance is of the previous generation and is not upgraded to the current generation, this severity is displayed. OK When the corresponding EC2 instance is upgraded to the latest generation, this indication is displayed. Region: This column shows the region in which the corresponding instance exists. Identifier: This column shows the unique identifier or the instance ID of the corresponding instance. Resource Name: This column shows the resource name or the instance name of your EC2 instance. Instance type: This column shows the type of EC2 instance. Current Generation: This column shows the status of whether your EC2 instances are upgraded to current generation or not. ‘Yes’ will be displayed when the instance is of the latest generation. Otherwise, you will see ‘No’ in that column. Resource Tags Applying resource tags filter will display those resources which have been assigned the selected resource tag. Let’s say, a user has tagged some resource by a tag named environment. Then selecting the environment from the resource tags filter will display all the resources with the tag name environment. Resource Tags Value Applying resource tags value filter will display data which will have the selected resource tag value. For e.g. – A user selects a tag named environment with a value say production (environment: production). Hence, the data of all the resources tagged as “environment:production” will be displayed. The user can use the tag value filter only when a tag name has been provided.